I am so excited to share my magic world of mixed media art and this particular class, Faces of Flow, with you. I absolutely love painting mixed media faces! My goal with this class, is to share my addiction with you :) Faces can be a bit intimidating to draw and paint and I know that many of us, me included, feel a bit scared and frustrated when we get to the "ugly stage" in the painting process and everything looks a bit awkward. I hope that I with this class will give you some tools and tricks that will help you to enjoy the process, instead of resisting it! I hope this class will allow you to flow through those challenging stages and to let go of that fear. One of my favorite tricks is to practice and play in a hand made junk journal. 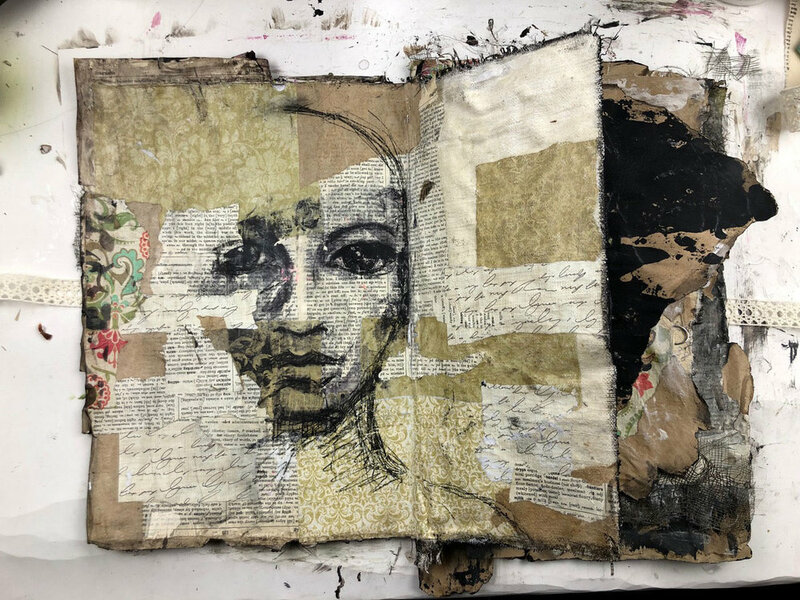 Not a proper art journal, with white clean pages or a precious art journal where every page is a piece of art BUT instead - a grungy, soulful, junk journal made out of scrap paper! A journal where the process is the important part and the result and outcome is secondary. I make my own visual art journals out of scrap paper, fabric and paint and in this class I will show you how I make them! The process is super simple and not very time consuming at all. I will show you several simple ways of creating and practicing painted faces! In the end, I will show you how I turn my journals into soulful pieces of art, packed with creative energy! I add, rip, paint and alter the pages all the time and they continually evolve. For me, art journaling is my resting place where I give my self time to recover. My art journaling process is totally free from requirements, rules, results or obligations. It is a way for our creative soul to be totally free and a way to find connection to the creative source within. Art Journaling is a very important part of my creative process and I’m excited to show you how it can help you to relax, to let go and to find your FLOW! You should feel safe working in your art journal. 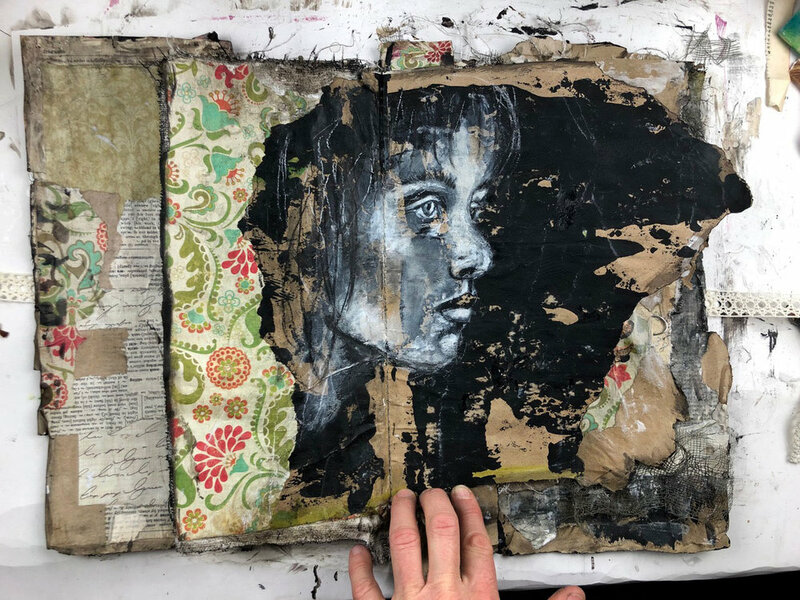 Ultimately, art journaling opens up the magic of what is unique within all of us! I hope you will join me on my 'Faces of Flow' journey. In the first lesson, I will show how I create a very simple and grungy visual junk journal. I will use scrap paper and fabric and put it together with a sewing machine. I will also show how to bind them, very simply, without a sewing machine, it only takes a couple of minutes. My journals are made out of scrap paper and paint that is left over in my other art making processes. I make the journals very rough and grungy looking and it is all on purpose to make it easier to let go of the wish to create something beautiful and perfect. I trick my mind to not only seeking beauty but to enjoy the doing. In this lesson, I will add a face to one of the spreads by painting over an existing picture. This is a very easy way of painting a face. You already have all the features and the lights and darks in the correct place. The important part is that we just DO and don’t think too much about the result. It does not matter if it’s not the most beautiful piece we have created. When we paint over an existing picture it usually becomes quite bold and the details are lost. The important part is not what it looks like, but rather that we enjoy the process! In the third lesson, I will add yet another face to my journal. This time, I do a transfer from a print of one of my paintings and then I draw over that. This is also a great way of adding a face and we can re-use drawings that we have done previously, several times. I love the look and feel of transfers and it is such a meditative process. You are going to love this approachable technique! In this lesson, we add the basic feature of the face with yet another transfer technique. We are drawing with white pencil and chalk on a black gesso background. This is a great way of creating and seeing form and value! A very valuable lesson! This dynamic way of working creates very striking results! You will want to incorporate this technique into your mixed media tool kit! In this final lesson, we do a simple free hand drawing of a face, focusing on the eyes and creating wonderful grunge textures too! Our goal is not to make a perfect face but to play around with the features until we feel happy with them. It is a good exercise to simply draw a face from our mind and try to discover and explore the proportions. I’ll show you how to create depth with shadows and lights too! This way of creating a face is freeing and full or experimentation! I hope you are ready to have some fun! In our bonus lesson, I will be doing some final touches to all of the pages in my journal, to make each spread look more cohesive. I add one more face and show a couple of tricks on how to tweak the faces that I am not totally happy with. This way of reviewing and adjusting our work is meditative and done in a gentle, explorative way. We learn from our mistakes and move on to create with more confidence and tranquility. So remember… the process and the time you spend creating is the purpose of the journey! The product is not the goal! I promise with this mind set, you will find this way of creating nourishing, inspiring and FUN! I hope you will come along and join me! A couple of pencils, Black and White Stabilo All, Aquarellable.